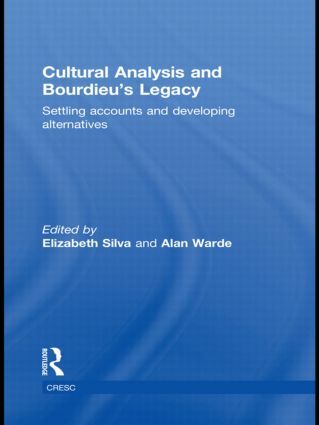 Cultural Analysis and Bourdieu’s Legacy explores the achievements and limitations of a Bourdieusian approach to cultural analysis through original contributions from distinguished international scholars. This edited collection offers sustained critical engagement, substantiated by new empirical work. It presents concrete evidence of different approaches to the interpretation of culture in Britain, France and the USA. Discussions are situated in relation to current debates about cultural analysis, in particular the vibrant and extensive disputes concerning the applicability of Bourdieu’s concepts and methods. Subsequently, implications for the future of research work in cultural analysis, including into theory and methods, are drawn. The contributing authors offer key interpretations of the work of Bordieu, arguments for alternative approaches to cultural analysis, and critical applications of his concepts in empirical analysis. This book is essential reading for graduate students of sociology, cultural studies, social anthropology or cultural geography, providing great insight into the work of one of the most eminent contemporary scholars in the field of cultural analysis.